If I kept a diary, November would have been recorded in it as a good news-bad news month. The children and grandchildren were all home for Thanksgiving. It was a great time. That was certainly good news. After the surgery and on the slow road to recovery. I only had my head raised for a moment so the photo could be taken. It was the first Thanksgiving without my dad, who died last March. Bad news. I discovered a new TV show during the month. Well, at least it was new to me. It’s called “The West Wing.” You see, I work second shift so I don’t see much evening TV. But Bravo, a cable channel, runs back-to-back episodes of “The West Wing” weekday mornings. I saw it for the first time in November and got hooked. More good news. And, oh yes, there was one more thing about November: I went blind in my right eye one night, underwent emergency surgery 48 hours later and was told that if I wanted to regain my sight, I’d have to keep my head down — basically looking at the floor — 24 hours a day for two to four weeks after the operation. Now that was some real bad news. The trouble with my baby blues actually began last March or April. That’s when I noticed that images were not as sharp as they had been, even though my eyeglasses were less than a year old. It turned out that I had cataracts, a clouding of the lenses, in both eyes. That wasn’t really a surprise to me; they run in the family. In October, Dr. Prem Virdi, a gentleman in the truest sense of the word and a skilled eye surgeon, removed those cloudy lenses and implanted in their place some man-made lenses. Stitchless cataract surgery is now done on an outpatient basis. It takes as little as 20 minutes per eye. After the surgery, which was done at Trinity in Moline, my eyesight, especially for distances, was wonderful. Both eyes registered 20-15, which is better than 20-20 vision. For reading fine print, Dr. Virdi suggested I just buy some “cheaters,” those non-prescription reading glasses sold at pharmacies. Everything was great until Nov. 6. One month to the day after the cataract surgery had taken place on my right peeper, it suddenly quit working. It was a Saturday night, and my wife and I were dining out with friends when the eye suddenly went blurry. If I had it to do over, I would have explained to the other folks right then and there what had happened to my eye, and I would have headed to the emergency room. But not being one to run to a doctor, even when I probably should, I waited until Monday, Nov. 8, to get that dead eye examined. My first stop that morning was Dr. Virdi’s office in Rock Island. He examined my eye and told me there was a hemorrhage in it and very possibly a torn and/or detached retina. This, he explained, happened to only about 5 percent of the people who undergo cataract surgery. He then called a friend of his, Dr. Leonardo Antaris, a retina specialist, who agreed to see me in his Davenport office at 2 that afternoon. If you think of the eye as a camera, the retina, located on the back wall, is the film. Light passes through the lens and is focused on the retina. The images then are carried to the brain by the optic nerve. So how do retinas tear or detach? There are a variety of causes for that. In my case, the cataract surgery caused the gel-like substance in the center of the eye that is attached to the retina to shrink. When it did, it pulled some of the retina away with it. The subsequent hole or tear in the retina allowed fluid from the gel-like substance to pass through, causing the retina to separate from the back of the eye. Learning I was about to undergo emergency surgery was a big shock. But my biggest shock that afternoon was learning about how I’d be recuperating. 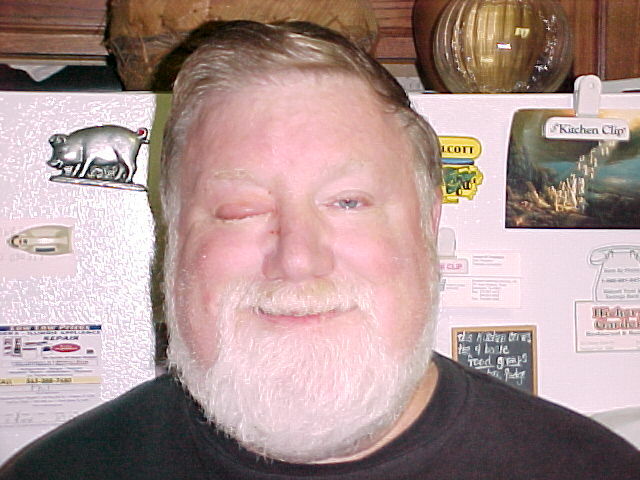 I was told that, at the conclusion of the surgical repairs, Dr. Antaris would pump a large gas bubble into my eye. Its purpose was to hold the retina against the back of the eyeball until it healed. For this to happen, I would have to keep my head down all day for two to four weeks. That meant no driving, no work, no sleeping on my back. The surgery that Monday night, Nov. 8, took two hours and was successful. I spent a night in the hospital, was examined in Dr. Antaris’ office the next morning, then went home to begin my head-down therapy. I soon became very familiar with people’s shoes and floor coverings. There’s not much else to concentrate on when you’re looking down all the time. A portable massage therapist’s chair, which we rented, allowed me to keep my sanity for the next couple of weeks. I also passed the time the next couple of weeks by recording my memoirs on tape (something my wife suggested) and listening to books on tape that she had gotten me from the library. I received permission, in my my next visit to Dr. Antaris, 11 days after the surgery, to begin phasing out the head-down regimen. Following three weeks off work, I returned the Monday after Thanksgiving. These days my life is pretty much back to normal, even though the bubble, now down to about a third of its original size, remains in my right eye. It will continue to shrink, the doctor says, eventually replaced by fluid produced by the eye, until it’s gone. In the meantime, it’s a distraction, but I can certainly live with it; it’s better than blindness. The bubble notwithstanding, the sight in my right eye is very good and getting better. It was 20-30 at last check. As you might guess, I have done a lot of reading about retinas and their repair in recent weeks, and I know it often takes months for vision from a repaired retina to become stable. I also read that only about 40 percent of the patients whose retinas are reattached, achieve good vision. Indications so far are that I’m in that group. Now that’s really good news! Copyright Dec. 22, 2004. This “Everyday People” column appeared in The North Scott Press, Eldridge, Iowa.